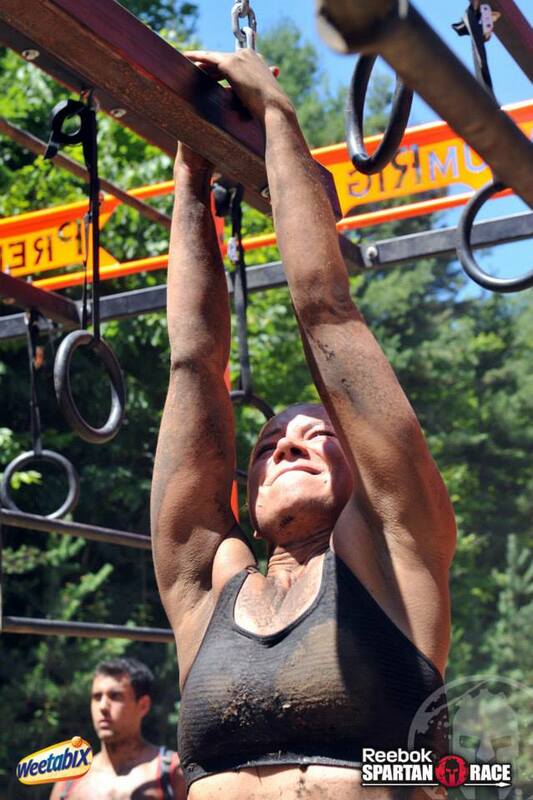 Yes, I’m talking about the Premium Rig – one of the new Spartan obstacles this year. 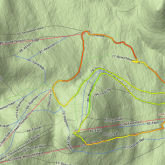 This orange monster, often deviously placed right before the finish line, is also affectionately known as Burpee Central. The exact composition of the rig varies race to race. 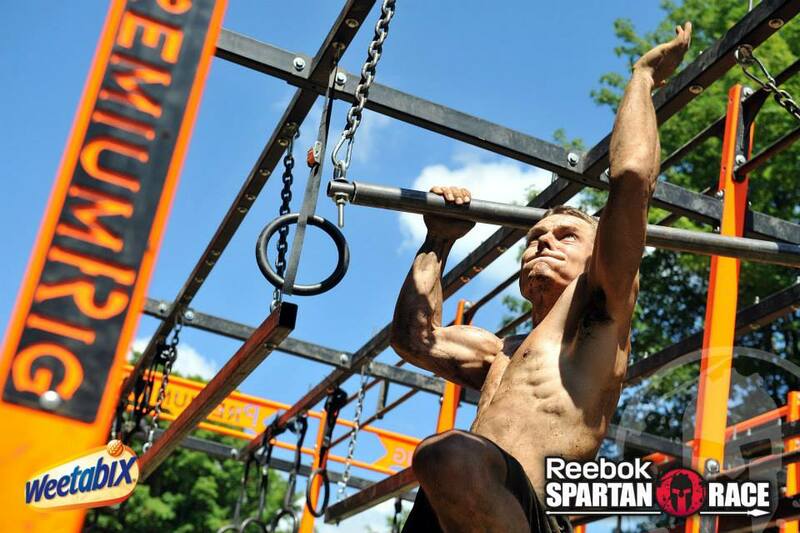 For example, in one of the Spartan Sprints, monkey bars were followed by a rope climb, and followed by the rings. Each section had to be completed separately before moving on to the next section, therefore, potentially resulting in 90 burpee punishment. This article focuses on the Premium Rig last seen at the Toronto Spartan Beast – tips, strategies and best ways to get across. 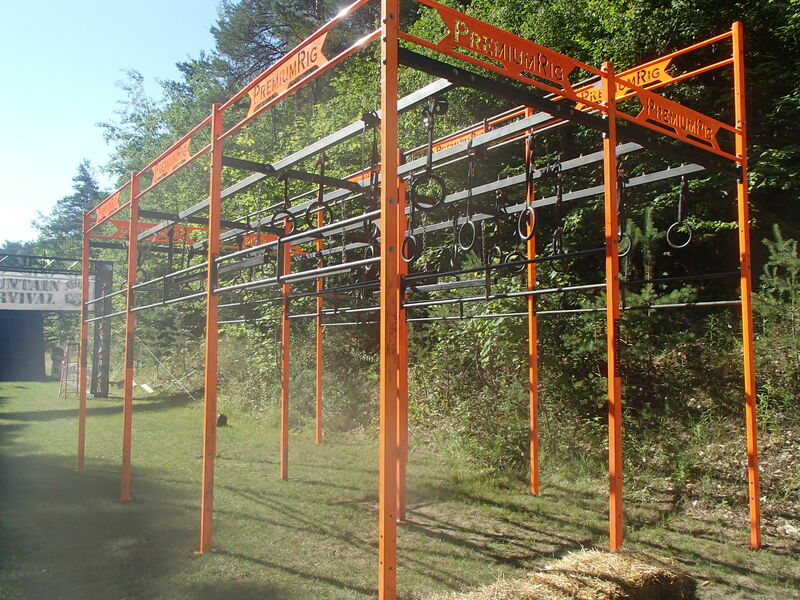 Rumour has it, this baby is going to make another appearance at the Ottawa Spartan Beast this weekend. Think a tamer version of Hang Tough from the American Gladiator (minus the shiny costumes and intentional kicks in the stomach). I was able to get across on my second attempt. It’s tough. Shorter racers are disadvantaged from the get go, because the initial rings are hanging quite high. You’d have to do one of two things: 1) jump high enough to take a hold of a ring, grab and hang, or 2) stack the hay blocks underneath you high enough to reach the ring without jumping. I think the second strategy is more energy efficient – you can plan your next move better, while standing on the hay stack, and holding on to one ring before letting go. As you are starting on the first ring, you may want to pull back to create more momentum on the swing. That will allow you to reach the second ring easier. I would advise against holding onto one ring with two hands in this section. Your wingspan (length of arms) is your best friend here. Once you are hanging off one ring, it will take an incredible amount of swinging to reach the next ring, and there is a good chance you will simply fall off. Your best bet is also to keep moving – notice the constant swing of my body in the video, as I get across the first four rings. I continue to pull each ring back with every swing, like a bow. It’s much harder to start moving again, once you stop – use the momentum to your advantage. Getting from the last of the four rings onto the square bar is fairly easy – they are nice and close together, and most racers I observed did not have a problem. There are many ways of traversing across – facing forward, sideways, or facing backwards (this one tends to be mostly accidental, I think). I’ve tried traversing both forward and sideways, and found the latter much more efficient (see video), as you are able to move across much faster – again, think wingspan. Notice that you really have to keep your shoulders and back engaged, and not hang off the bar like a dead fish. If you fell off here, and seek redemption, find some bars in your neighborhood, and practice traversing across. The key is to practice on different thickness and different texture – look for tree trunks, soccer goal posts, gas pipes, etc. You can one-arm it – grab the ring with one hand, and then swing directly forward, and grab the round bar with the opposite hand. This seemed like a successful strategy for those familiar with the rig, and who did not seem to have trouble getting across at all. This is also what I tried doing on my first go, and fell off, as the round bar rotates. You can see the second strategy in the video. I am hanging off the single ring with both hands, create a bit of a swing and then reach for the bar with the UNDER-grip, palm facing towards me, and then holding tight, I reach with the other hand with the OVER-grip, palm facing away from me. The alternate grip stabilizes the bar, and does not let it rotate. This racer is reaching with the OVER-grip (and is looking quite awesome doing it too!). This is how I fell off in my initial attempt – I reached and slipped as the bar rotated. 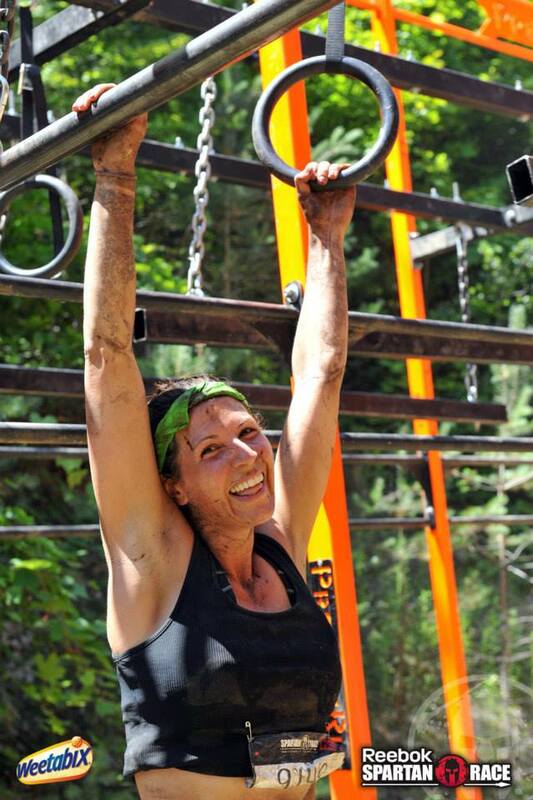 Finally, another method that I have seen racers use is to reach over and hang so the bar is under your armpits. This approach gives your grip some rest, and also gives you an advantage of being higher up, and therefore, closer to the next ring. This is probably the toughest section of the whole rig. This is where even the racers who did not have a problem up to this point fall off. Here’s the problem. Those that do not fall off the rotating bar, end up hanging off of it in a deadhang (arms completed extended, traps/lats not engaged). Given that the ring is actually quite a bit higher than the bar, and also further away, it’s almost impossible to reach it from a deadhang. I have an advantage of longer arms, however, most would need to perform a chin-up or a pull-up (depending on grip) and bend the elbows in order to reach. Another method would be to transition from a deadhang to hanging onto the bar with the creases of your elbows (giving you extra height). Take care as the last two rings are quite a bit apart (you see me almost fall at this point in the video). Again, you do not want to end up hanging onto the second last ring with two hands. Usually, you can take your hydration pack off, and pick it up after you complete (or do not complete) this obstacle. The less that gets in your way, the better. Dry your hands as much as possible. I’ve seen some racers whip out chalk – now that’s pretty impressive prep. I don’t know if I’d go as far as carry a chalk bag (that you would have to pack in a waterproof container), but even wiping wet palms on dry grass or directly on the ground can improve grip. In my experience, gloves do not help. If you wore gloves to the race, by this point you’d have an idea of whether you found them helpful on the monkey bars, and can choose to keep them on or take them off. Were you able to get across the Premium Rig? What would you do differently? Any other tips? If you end up using any of these tips on the Premium Rig or any other obstacles, please leave a comment, and let me know. 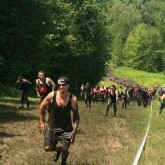 Note: Pictures with the Spartan logo are courtesy of the Spartan Race.